Using explosive movement and satirical humour, two indigenous performers tread the timeline of appropriation of Indigenous bodies, from cowboys to Coachella, exploring concepts of identity and colonization. 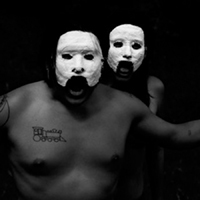 Through movement, mask and the subversion of the performance of Red Face, a history of social masks comes alive in this timely and impactful devised performance by Todd Houseman and Lady Vanessa Cardona. Cowboys versus Indians—the Indians are the baddies and they should die. That’s how Hollywood used to portray westerns, and that’s how the show opens. Unfortunately, that theme continues to run rampant today. Society has made a lot of progress but we have a long, long way to go. Call someone the N-word and what do you think those in earshot would say? Call someone another drunk Indian—now what do you think those nearby would say? Would the reaction be the same? I think you know the answer. Whiteface looks at the debasing and marginalisation of our Indigenous peoples from multiple angles. Through the adventure, you undergo various emotions, including anger, hate, sympathy, sorrow, and the list goes on. You can feel the emotion pulse through the actions and the dance, and hopefully, it resonates with you. This powerful piece expresses through imagery, dance and expression. The show runs 45 minutes. If I had a suggestion for improvement, I would take the extra 15 minutes and include more dialogue—more discourse on the abject wrongs that have sieged your people through history, and continue to do so today. Don’t hesitate to see this brave and important piece of work.